And so it was with this backdrop that those lists of dead racehorses we were disseminating prior to had, by day’s end, grown just a bit longer. Dead: 3-year-old Zamjara in the 1st, 4-year-old Rootformejustin in the 5th. 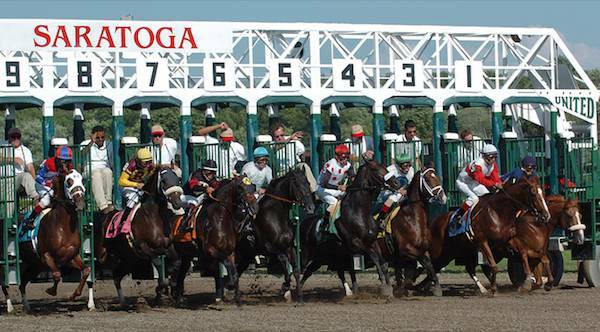 I was at Saratoga Race Course yesterday – along with 40 or so other activists. We were there, of course, to protest the systemic abuse and killing of horses for entertainment. On this gorgeous upstate-NY summer day, 30,000 souls merrily marched through the front gates, anticipating a social scene practically unrivaled on the East Coast. Sure, Saratoga beckons the hardened “players,” but it also attracts the kinds of demographics you won’t find at America’s more pedestrian (read: cheaper) racetracks – middle-class families, sunscreen and coolers in tow; the upper crusts, styling young and gaudy old alike. And yes, there were limos. And, my personal favorite: “You’re obscene.” Yes, it is we, the advocates speaking in behalf of innocent, defenseless animals, who are the obscene ones. And so it was with this backdrop that those KIA lists we were disseminating prior to had, by day’s end, grown just a bit longer. Dead: 3-year-old Zamjara in the 1st, 4-year-old Rootformejustin in the 5th. The party, alas, had been marred – if only a tad, if only for a day.